Stir the butter and brown sugar together in a bowl until creamy, and then add maple syrup and stir that in too. Then separate the egg, reserving the white and putting the yolk into the batter. Mix the yolk in, then add the flour and knead the batter until it is a dough. Wrap it in plastic wrap and refrigerate for at least half an hour. When it's ready, take the dough out and roll it out on a working surface, to about 1/4 inch thick. Use a medium-sized heart cookie cutter to cut out hearts, then cut a heart out of the middle of each with a small heart cookie cutter, re-using all the scraps of dough over and over to roll out and cut more cookies. Arrange them on a cookie sheet. Just before you bake the cookies, preheat your oven to 350º F. Take the reserved egg white, froth it up with a fork, and then use a brush to coat each cookie with egg white. 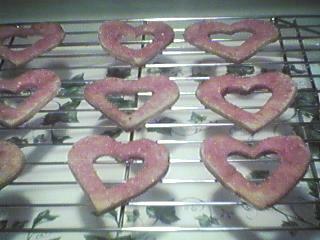 Sprinkle the pink sugar onto the cookies. Bake for 10-12 minutes--they should be golden brown. Take them out of the oven, let them sit on the cookie sheet for a few minutes, then let them cool the rest of the way on a wire rack.